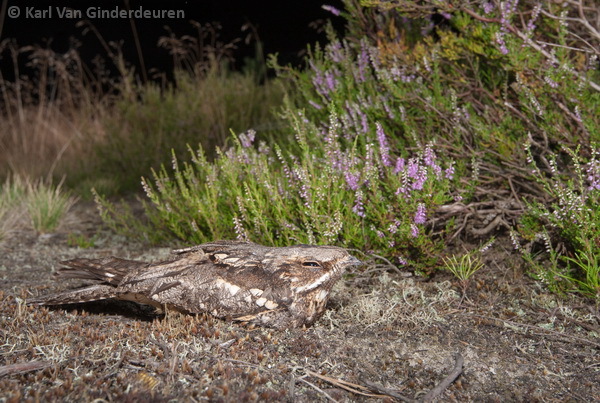 This weekend I got the exceptional chance to team up with a biologist studying european nightjars. As usual it was easy leveling with PJ, who knew instantly how rare this opportunity was. 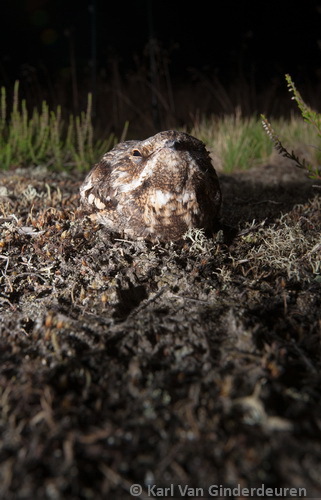 Whether spending hours in a hide, or doing night work with infra red barriers and many flashes, two heads are better than one… Also, when working at night, one can keep the other motivated when getting very tired. 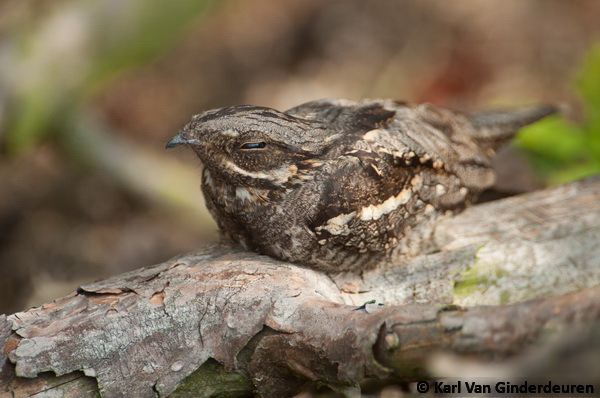 The Latin name Caprimulgus europaeus refers to the old myth that the nocturnal nightjar suckled goats, causing them to cease to give milk. Hence its nicknames all over europe: goat sucker, tête-chèvre, geitenmelker, ziegenmelker etc. 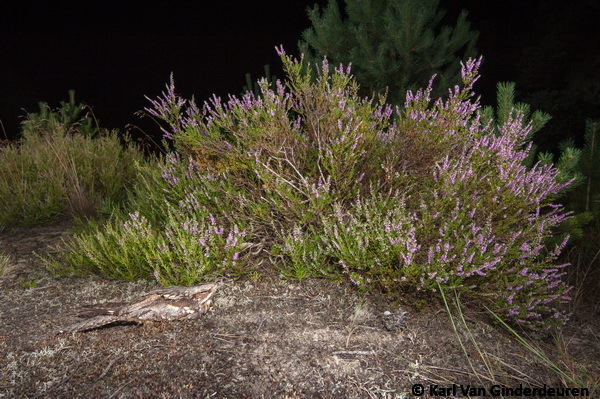 Nightjars are extremely difficult to see and thus photograph but thanks to Ruben we were allowed a day in the field, to assist him in his fieldwork for a PhD on nightjars. 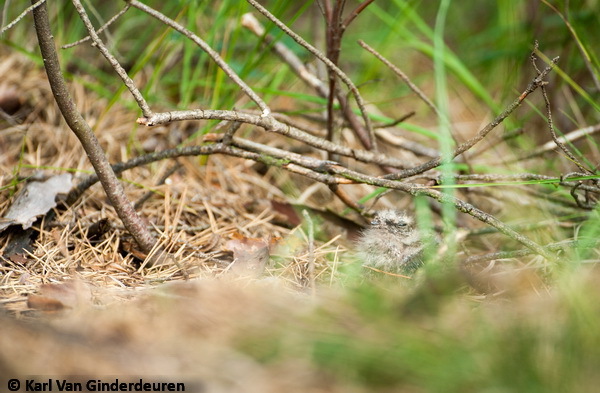 Upon arrival in the forests near Leopoldburg we were greeted by a lot of quails and this mother and bambino. 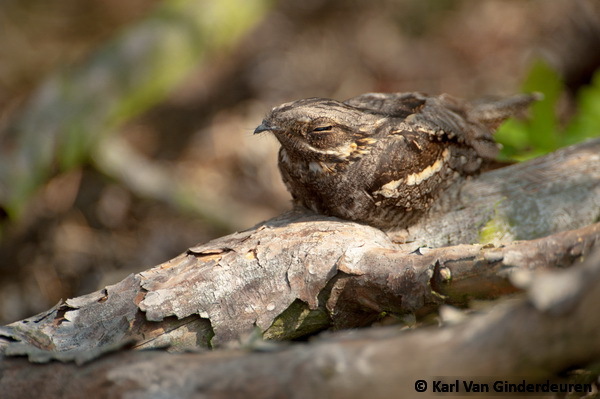 From dusk till dawn, the coniferous forests are alive with rolling sounds, made by male nightjars. The first we found was sitting in a dead tree. Without help, this is the only sort of sighting you would get, since the birds are so camouflaged during daytime. The first morning we placed a hide near a nest to see what was happening. Not that much in fact. The young were laying low and mother was probably sitting on a branch. Hours of waiting went past. Still only a handfull pictures made. 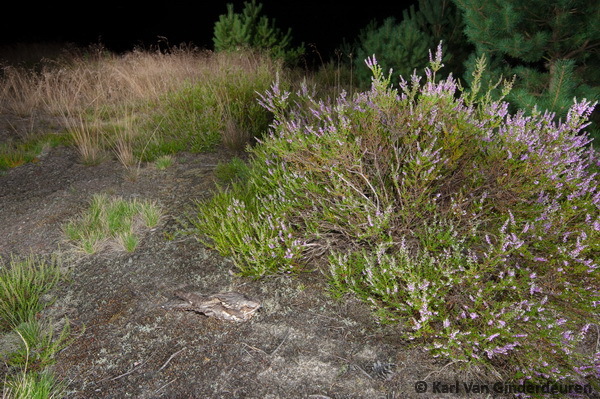 Then we visited another site were we saw a mother nightjar with her youngsters. Also lying low. Very difficult to get good pictures, indeed! Mother with two youngsters (right and rear). 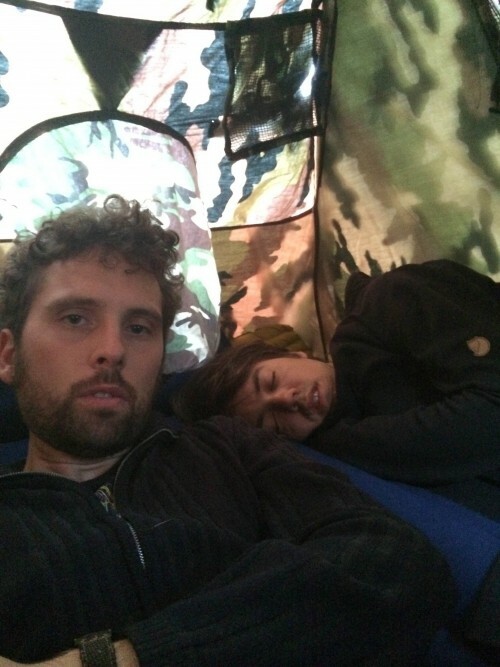 The following image shows another female sleeping on the forest floor. The camouflage is unbelievable. Every time we played the game were PJ and I had to guess where the bird was, whilst Ruben gave us tips. We almost never found it. Following, we tracked another male down to a certain tree. We started looking and found nothing. Ruben looked for two minutes and found the male pearched up a dead branch. 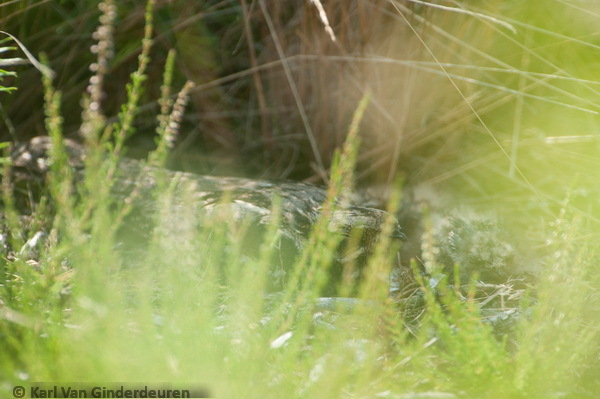 500mm and a lot of crawling later… We got very very close (4m) and full framed it. 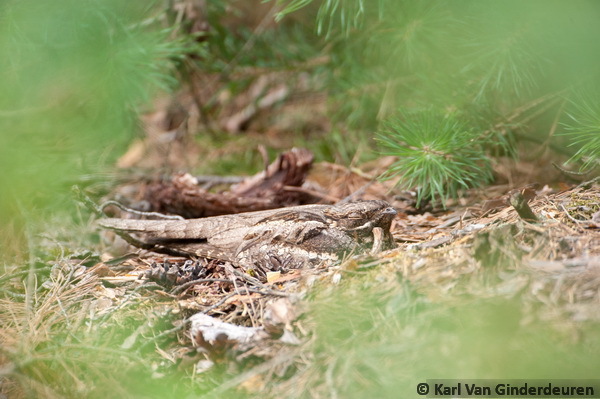 You can spend hours looking at the camouflage of these beauties. 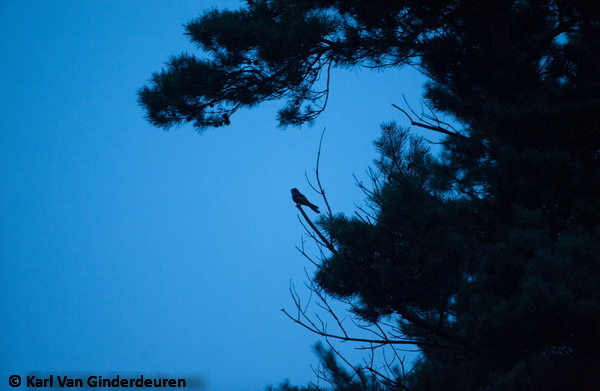 In the evening we tried capturing nightjars to get satellite data back, and to ring new birds. After two hours we caught a bird so PJ and I set up a lot of flashes trying to photograph the bird with a wide angle when it was going to be released. We were very happy that it stayed for several seconds… turning into several minutes. This was the time of our life, getting very close to the bird, which was -as usual- relying on its camouflage. I want to deeply thank Ruben and Eddy. Ruben is one of those field biologists who knows how to read the environment, who loves his study object and who likes it when others share his enthusiasm. 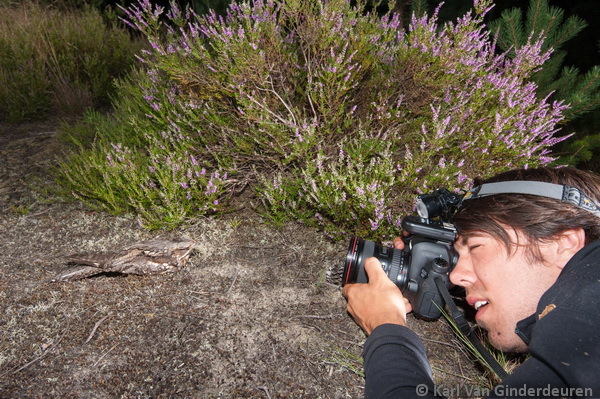 He is doing very well and learned us a lot about nightjar ecology. For example: I did not know that females can abandon a nest to start a second one, leaving the male to raise the young of the first nest. Eddy is one of the most impressive foresters I have so far met. 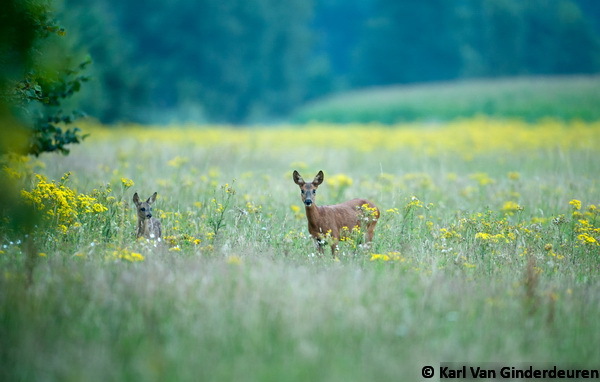 He knows the woods and the plants, butterflies, birds and mammals that dwell within. 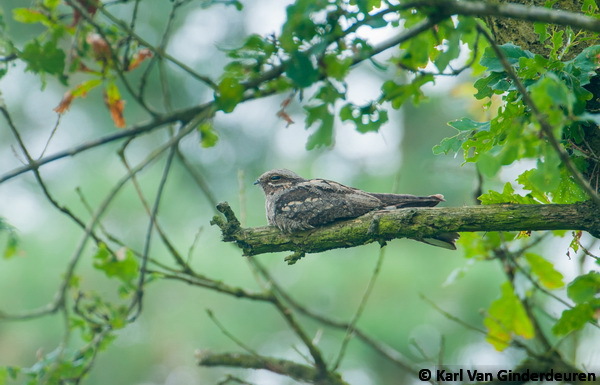 In the end what we found most beautiful I guess, was seeing a flagship species being studied by very professional people in a needly managed woodland. Yes We Can! !